This Lotus Diamond Ring from Van Cleef & Arpels is quite simply one of the most stunning pieces of jewelry we've ever carried. 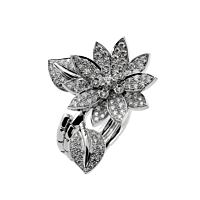 The highly-detailed 18k White Gold floral design was immaculately crafted to mimic this piece's beautiful namesake, the legendary lotus flower. The exquisite look is flawlessly completed by the addition of a plethora of sparkling Diamonds across the exterior of the Ring, imbuing it with a sense of majesty which is second to none. Positively radiant!